Isla found this video on You Tube, which is a behind the scenes look at Victoria Beckham's Elle magazine shoot. Before I left London for New York, I saw a huge billboard of David Beckham advertising the new Motorola's new MOTORAZR2 V8 Luxury Edition phone. You may remember David first promoted this phone last month on his tour of Australia. The luxury-edition handset is 18-carat gold-plate and is likely to be a hot product for the design-conscious, so it is no wonder David is the face of the brand. It also comes with an engraved diamond-cut pattern on the sideband. I am not really a Motorola phone fan, but this is one smart looking phone. 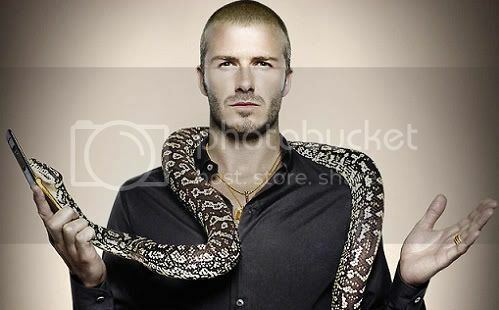 Brave David, also appears with a snake for one of the ads from the campaign. No matter what they paid me, they would never be able to get me to pose with a snake. It has been reported by the Sunday Mirror that Victoria Beckham has had designer gear worth tens of thousands of pounds stolen from her dressing room in Germany. When Victoria has finished on stage she returned to her dressing room to find it ransacked. Bizarrely, none of the other girls were targeted. Two pairs of shoes, at £5,000 each, were pinched along with stage outfits, including jackets and jewelery. But Victoria was most upset when she found they'd taken a red satin dressing robe that Roberto Cavalli had designed especially for her to wear backstage. It had "Mrs Beckham" on the front and "Posh" on the back. A backstage source told the paper: "Victoria's post-show high was ruined when she noticed stuff had been nicked. "All the other girls' dressing rooms were untouched, but somebody had clearly been rifling through Victoria's possessions". "She was very upset. Fashion means everything to her. She keeps all her old outfits in storage." While the Cavalli gown was a one-off personal gift, Posh can probably afford to replace the rest - her clothing company DVB was last week valued at £100million. I am not sure about this story, based on the fact that Victoria has a lot of security. I can't see anyone getting passed them. Victoria Beckham To Be A Judge On Project Runway? There are rumours that Victoria Beckham may be a judge on "Project Runway." While nothing is yet confirmed, the gossip is that Heidi Klum is hoping to secure Victoria Beckham as one of her high profile guest judges on "Project Runway." I think if this is true, Victoria would be crazy to turn this opportunity down. Firstly the show is a ratings winner, and secondly she would be able to show people what a great knowledge she has about fashion. I would like people to see her for more than a woman who pouts and makes fun of herself. David Beckham's interview was broadcast today after the Queen's speech. I’m writing this on the plane on the way home from Madrid – I can’t believe it was our last show of 2007, the time is going by so fast. It was great to return to Madrid having lived there for so long. I had the chance to say hello to some friends before the show, which is always nice. We’re having so much fun on tour. I know it sounds like a cliché but it really is the truth. I think for me, the highlight so far was Tuesday night at The O2 Arena in London and having our kids on stage with us during Mama. I’ve said it lots of times before but my boys really are the reason that I am doing this and to have them up there with me was a very proud moment. Talking of the show on Tuesday, Mel B lost her bracelet as it flew off in to the audience and we want to say a big thank you to David who picked it up and contacted our management company to tell us that he had it. We’re grateful to him for being so honest and we’ll be meeting up with him before one of our shows in January to say thank him in person. Roberto Cavalli came along to a couple of the shows in London. He has worked so hard on our amazing costumes so it’s great for him to see us up there performing in them. We have a little break now and then we'll be back at The O2 Arena in the new year before heading up to Manchester, where there is always a fantastic atmosphere so we’re excited about that. On a personal note, I'm really looking forward to performing in Manchester as we lived there for quite a while and I really love it. I'm really looking forward to Christmas, to spending time with David, the boys and my family. We are taking the boys to see Father Christmas and they are so excited! We're about to land so I have to go now but thank you all so much for your support. I hope that you all have a lovely Christmas and we’ll see you in January! Who Wore The RM by Roland Mouret 'Arial' Skirt Better? Victoria Beckham appeared on Jay Leno back in July wearing this RM by Roland Mouret ensemble. The skirt she is wearing is called the Arial skirt. It looks like it's copy Victoria Beckham, week as Katie Holmes was spotted on Friday wearing the same RM by Roland Mouret Arial skirt whilst out shopping, with the largest Hermes Birkin I have ever seen. Even Victoria does not have a Hermes Bag that big. Labels: Katie Holmes, Victoria Beckham, Who Wore It Better? Who Wore The RM by Roland Mouret 'Moon' Dress Better? Victoria Beckham was the first celebrity to wear the RM by Roland Mouret collection. She first wore this fusicha RM Moon dress to David Beckham's Introduction to LA Galaxy back in July. She teamed her stunning dress with a pair of Balenciaga court shoes and an equally stunning pink ostrich-skin Hermes Birkin. Kelly Osbourne partied with the Duffs's on Saturday night wearing the Navy version of this dress - which I have - and she is carrying a Prada Tessuto Fiocco Muff Bow Clutch Purse - which I also have in Pink. No contest...Vicky B all the way. David Beckham has revealed that his taste for extravagant clothes started at an early age in his BBC Radio 2 interview to be broadcast on on Christmas Day. He said that as a young page boy he chose to wear knickerbockers, long socks and ballet shoes in preference to a suit. "My dad gave me a little bit of stick, but I was happy," he said. 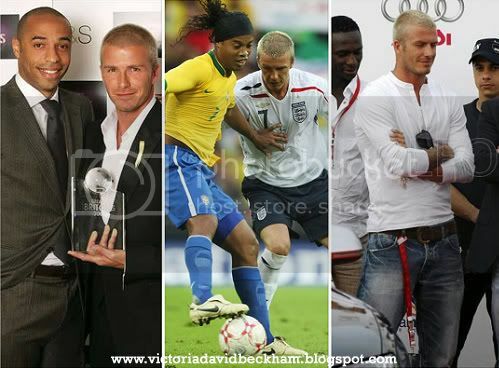 Beckham answered questions from listeners on a variety of subjects ranging from his relationship with Sir Alex Ferguson at Manchester United to playing under new England coach Fabio Capello at Real Madrid and even his family's footballing skills. 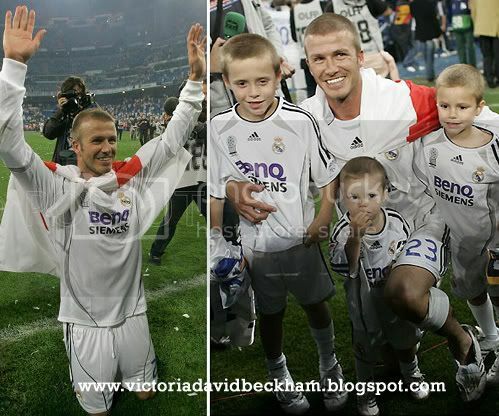 Of his son Brooklyn's talents, Beckham said: "He's got a great strike on him, a great right foot, and he kept the ball up 64 times". "Eight years old, it's pretty good!" 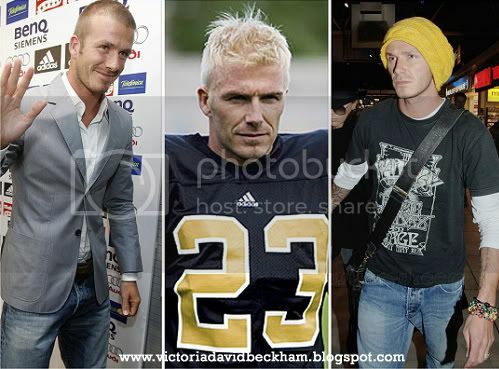 His popstar wife Victoria, though, is "not great at goalkeeping", but "she hasn't really got a choice there". "The boys all just tell her to go in goal and then just kick balls at her." He went on to tell presenter Kate Thornton that scoring the winning penalty against Argentina in the 2002 World Cup was a defining moment in his career, a moment of redemption after being vilified by the fans for his sending off against the same side four years earlier. "For me, it was the best and biggest thing that I could've ever done in my career at that time," he said. "The moment the ball struck the back of the net, funnily enough, my mind went clear, everything that I was thinking, everything that I had gone through". "I knew how much it meant for me to score that goal for my family, and of course for the fans, because the rivalry against Argentina is huge." Here is that special goal. David Beckham's Line of Enquiry will be broadcast on Radio 2 at 3.05pm on Christmas Day (after the Queen's speech) and will be available online afterwards at bbc.co.uk/radio2. Here is the Spice Girls "Greatest Hits" album were Victoria Beckham gives thanks to all who supported her. I love the end were she says, "Brooklyn, Romeo, Cruz, this is for you...Mummy was a pop star!!!" Cute. Oh and I adore this picture. The Spice Girls are playing in Madrid this evening and while there were having their sound check, David Beckham went out for dinner. He dined at his favourite restaurant Asador Donostiarra. You may remember that this is the same restaurant where David had his farewell dinner with his Real Madrid team mates back in June. After dinner David brought two 'Pata negra' first quality Spanish jamón (ham) and a box of his favourite Spanish wine. So is Christmas going to be a Spanish affair David? Feliz Navidad. Every time I think there will be no new news this year I find this. I am not sure which I prefer...the black and white version or this colour. Both are equally hot. Victoria Beckham "You Better Work"
Why The Big Smile Becks? Spice Girls Kids Join Them On Stage For "Mama"
Is Victoria Beckham Getting Special Treatment? I Ask Again...Is Victoria Beckham Pregnant?